It has been said that “mothers have eyes in the back of their heads” when it comes to their young children. While you do not actually have those backward seeing eyes, having a good baby monitor can make it seem like you do. 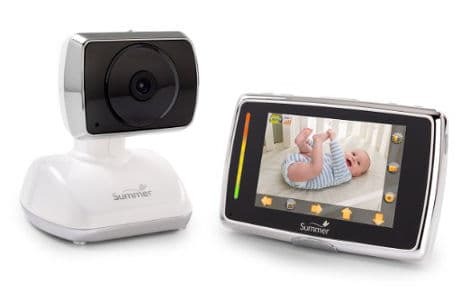 For many parents, keeping an eye on one child in one room simply is not enough, so for those mothers and fathers who want the best baby monitor for multiple rooms, here is our review on some of the best baby monitors for multiple rooms. 2.4 TFT screen with a super sensitive microphone. 2.4 GHz static free digital wireless transmission suitable for distances of up to 800 feet in open areas and 150 feet in enclosed areas. Uses auto frequency hopping system. Auto Infra red night vision. A/C Power. 6VIA DC adaptor. Automatic voice activation power saving mode for the monitor unit. Shuts down automatically if no sound comes from the baby’s room in 3 minutes. This baby device is a well designed and thought out basic baby monitor. While it lacks some of the bells and whistles that some other monitors might have like talk back features, room temperature features, the ability to play lullabies and the fact that it is not smart phone capable, it does a good job of capturing sounds and images of your child’s room. The camera comes with both a stand and holes for hanging, giving you more versatility in your choice of where to place the monitor. The monitor itself is lightweight and extremely portable with the ability to adjust the screen brightness and volume. It is also equipped with the ability to turn the VOX on or off, which shuts down and wakes up the camera when the run is quiet, and has an auto mute button so you can turn off the sound and just have the view. While keeping the VOX feature on will help to save on to the battery, you can turn this feature off and keep everything running which can be handy. You can hook up to 4 cameras to the monitor, but you have to manually change to view each room. A clear view of their child’s crib or bed. Takes the temperature of the room. This device seems to be well designed and has all the features that many parents are looking for. The camera swivels, tilts and zooms, and while you can zoom from the monitor, you can only operate the swivel and tilt manually. You can also place 4AA batteries in the camera to serve as a 4 hour backup should the electric go out. The monitor will monitor the noise level in the room and the intercom allows you to soothe your infant or speak to your toddler without being in the room. It has a 10 hour battery life and 1000 foot range. You also have the option of hooking 2 or 4 cameras to the monitor. In our view, while the talk back feature on this device is handy for some babies, it can be frightening to others. We also like the idea that you have the option to be aware of the temperature in the baby’s room. The zoom feature is great. 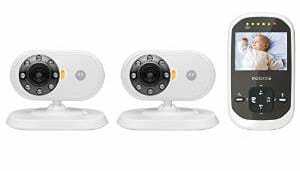 The Motorola MBP33 Wireless Video baby monitor is a solidly built monitoring system that has all the bells and whistles you could want in a baby monitor. This device will also work well for care givers of those who are ill or elderly. Three additional cameras can be added to the monitor. Gives you a warning when you are out of range or the battery is low. The camera takes a temperature reading of the room and you have the option of talking to your baby through the intercom system. It can be manually tilted a slight degree to help you fine tune your viewing angle and has a clip on the back that can be pulled out so that the camera can sit on a dresser or a stand. The monitor allows you to adjust the brightness and the volume to your liking and it has 5 LED lights on the top to indicate the noise levels in your child’s room. It also warns you when it needs recharging. In addition, there is an antenna on the back of the monitor that increases the monitor´s range slightly. This Summer Infant monitor is ideal both for when your child is an infant and when they grow into a more active toddler. 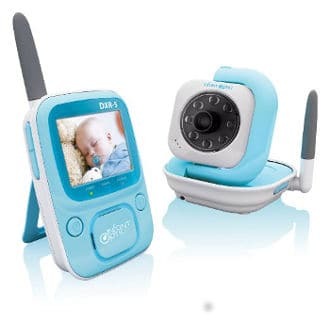 We like the fact that it has one of the largest screens for baby monitors which will help assure parents they won’t miss a thing and also find that the ability to remotely pan the camera to scan a room is ideal for growing toddlers. You can remotely pan, scan and zoom. Out of range indicators and low battery. Can attach up to 3 cameras. This monitor’s camera can be mounted on a wall or stand on a dresser. The camera pans a full 360 degrees which makes it great for keeping track of toddlers when they are playing in their room. There is also a talk feature so you can speak to your child without being in the room. The monitor for this system can be panned and scanned remotely which is a huge benefit once your infant becomes a toddler. The battery normally runs 8 to 10 hours. Reviews for this Summer Infant monitoring system are positive. Users do find some things they don’t like about it, but the complaints are so scattered that it is difficult to know if the problems are with the system or they are due to user error. Has a nice long cord. Offers a great day vision and an adequate night vision. 2 cameras with infrared night vision. LED sound level, low battery and out of range alerts. This system comes with 2 cameras that can be set up in two different rooms as well as a battery pack for recharging the parents monitoring unit. The monitor does have a short battery life of only 2.5 hours and there are 2 power adaptors for the cameras. While the camera doesn’t come with any mounting hardware, it does have holes for mounting on the wall. Also, you can set the monitor to shuffle between the 2 different cameras automatically. While we really like the fact that this monitoring system comes with 2 cameras right from the start, we are a bit dismayed at the very short battery life for the parents monitor. This makes it necessary to keep it on the charging base, making it less portable than we think it should be. Ability to zoom and pan. 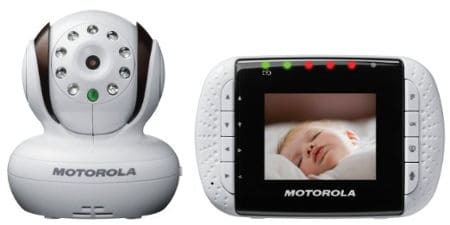 In conclusion, knowing what to expect from a baby monitor will help you make a more informed choice when you need to buy the best baby monitor for multiple rooms.